ep. 52 - Jason Barger: Speaker, & Author of "Thermostat Cultures" and "Step Back from the Baggage Claim"
Jason Barger is committed to engaging the minds and hearts of people in order to strengthen leadership, culture, and clarity of mission, vision & values. Prior to sleeping in airports and observing human behavior, Barger led over 1700 people to construct 125 houses internationally for families living in poverty as well as implemented the Streets Mission Project to serve the homeless on the streets of Columbus, Ohio. As the former Director of First Community Church’s Camp Akita, he designed leadership programming focused on living with joy, love, compassion, faith, and service for over 1900 campers a summer. Jason is a graduate of Denison University, where he served as Captain of the men’s basketball team, and also received certification from Georgetown University in Nonprofit Executive Management. In 2004, he was one of five people in Columbus, Ohio to receive a Jefferson Award, a national award given to “Ordinary People Doing Extraordinary Things”. In 2014, he was selected as a “40 Under 40” award winner by Business First. ReMember: renewing our memberships, relationships, and focus in a distracting world. Gail Davis: Today in our studio, we have a guest, Jason Barger. Jason is a leadership culture and service visionary. His books have been celebrated by the New York Times and other global media, and is the founder of Step Back Leadership [00:01:00] Consulting. He is a sought after collaborative partner with teams and organizations to develop compelling leaders, culture and visions for the future. For ten years, Jason lead thousands of people to build 125 houses internationally for families living in poverty, and developed a program to serve the homeless on the streets of Columbus, Ohio. In 2004, Jason received a Jefferson award, a national award given to ordinary people doing extraordinary [00:01:30] things. Jason is passionate about engaging the minds and hearts of people in order to strengthen leadership, culture, and the clarity of mission, vision and values. Please welcome to GDA Podcast, Jason Barger. Welcome Jason. Jason Barger: Glad to be here. HQ. Gail Davis: Yeah, the big head quarters. We learned that Jason was going to be in town and stopping by, and so we scrambled and we have a podcast. One of my favorite things about you, Jason, is [00:02:00] how you got into this whole step back from the baggage claim. Gail Davis: I think you should start with that seven day odyssey and tell people what that was all about and how it's become a metaphor for so many things that you're known for. Jason Barger: You mean why I'm such a strange person? Gail Davis: Yeah, start there. Jason Barger: Right, okay. You got it. Yeah. Anyway, it's great to be with you guys. Yes, so step back from the baggage claim movements that began really now back in 2008, is when it really began. [00:02:30] But I spent seven days traveling to seven different airports, seven cities in seven days without leaving the airports the entire time. I was the creepy guy, you know, sleeping on the floors and in very uncomfortable chairs in seven different cities across the U.S. Then watch, you know I was there just to observe human behavior and watch the way that we are literally moving throughout the world and wrote this book, "Step Back from the Baggage Claim," which if you've been to a crowded [00:03:00] baggage claim anywhere you know the scene of you know people as soon as the buzzer thing goes off, which Gail, I know you love this. The sound that we've come up with. For some reason we have not come up with a better sound than that thing to tell us the bags are coming out. But instinctively, what do we all do? Like idiots, we all rush up to the baggage carousel. We form what I like to call the human wall of entitlement, where no one can actually see the bags. We all fight and rush because I'm in more of a hurry than you, and [00:03:30] my bag's more important than yours. We just perpetuate this hectic race around the baggage claim. Well I watch that in seven different cities over the course of seven days and then wrote this book, "Step Back from the Baggage Claim," which evidently again it was about the way that we move throughout the world, but it was a metaphor for how do we actually move throughout the world in our everyday lives, but then certainly in the teams and organizations that we serve. Fortunately, that metaphor [00:04:00] connected with a lot of people around the world and began the next weirdo journey I've been on. Kyle Davis: You know, I've traveled a lot. I mean, you know, especially you know, a lot recently domestically. But through my life I've traveled a lot. I've always found airport people watching to be like phenomenal. Jason Barger: Yeah. Yeah, yeah. Kyle Davis: Depending on the airport that you land on it can be really, really awesome. St. Louis, love the cowboy hats in that one. But what I'm kind of wondering is at least [00:04:30] for me like, I'm always thinking like 3 or 4 different groups of people. You know, you have the people that are on business they're just like man on a mission or woman on a mission trying to get somewhere. You have the family who probably they're traveling too early life with the kiddos. Then you have like, there's always some like group or team or something then there's just like everybody else. I'm kind of wondering from your perspective, I mean the general question really is, is how are we moving through the world? Did you see some like segmentation within [00:05:00] the people that you saw while you were doing this during your seven days? Jason Barger: Wow, great question. Yes. How are we moving throughout the world? The quick answer is, quickly. You know, that the world is moving so fast and yes, there are all those different segments that you're describing. But what people began to connect with that metaphor, is they began to see if that's literally how we're moving throughout the airports, where you have thousands upon millions of people every single day that their lives [00:05:30] are colliding together in these airport locations, but they're all going different places. They all have different agendas, and they all have something they're trying to accomplish. Yet, it becomes this space where, how do we move? How do we participate in that space? That metaphor began to connect with people. They thought about their families, they thought about their communities, and then obviously they thought about their teams and organizations. As then that first book, Step Back from the Baggage Claim, as it [00:06:00] began to resonate with people, then all of the sudden there was a business edition to the book because people started to see how does that relate to the way that in their business culture how they move throughout the world everyday? Then there was a healthcare edition. What does this mean for hospitals and people in healthcare industry? Then schools and universities. How are we moving throughout the baggage claim of education? How we move impacts the effectiveness of the journey that we have. Kyle Davis: [00:06:30] Kind of like froze my mind, because the last thing you said actually touched on something, is how we move. One of the things you said a minute ago was that we're moving through this world in a very quick or haste manner. Jason Barger: Right, [00:07:00] right. Kyle Davis: With those long corridors. With people are, you know those moving sidewalks where people are dragging their bags. But at the same point in time as they're walking on a moving sidewalk, they're also looking at their phone. Kyle Davis: They never look up. Kyle Davis: Is that the world that we're in, or should it be something where you know, maybe people can take all that but so long as they look up and they see what's in front of them, then they can kind of you know, maneuver more? Jason Barger: Yeah, so the Harvard Business Review did a study recently where they studied thousands of what they deemed to be the modern workers today. Thousands of people they studied, [00:07:30] that they thought represented the modern worker today. All it did, is it would track with a software tool called Rescue Time, it would track how many times did the modern worker shift their focus and their attention from one task to another in an average day. All it did, keep a little tally. How many times did you start one task and then jump over here and start working on another? What it found, was that the modern worker today is shifting their focus and their attention anywhere between 300 and 500 times in an average day, [00:08:00] which didn't even include their smartphones. That person going down, you know that's also on their phone, they've painted this image that the modern worker today has never been more distracted and cluttered and this term busy-ness, which we've come to honor, that somehow this myth that we've bought into that the faster I run, the further I get, and yet the result of the study was is that it's leading to about a 30% productivity. So about 30% of the time are we actually being [00:08:30] productive and effective in whatever it is we're trying to accomplish, and yet when you ask these modern workers, "Hey, how's it going? How are you performing on the job?" Their answer is, "Great. I'm so busy." Jason Barger: Somehow we've bought into this myth that the faster I run the further I get, and that busy-ness equates to effectiveness. Yet as you step back from the baggage claim in your team in your organization, we step back and we look at the most effective individual leaders, teams and cultures in the world. [00:09:00] You start to realize that they're the ones that actually are stepping back and are getting clear on what has to get our focus, what has to get our eyes, our attention, our hearts today, this week, this month, this quarter. Kyle Davis: You know, one of my favorite quotes that I heard a lot recently, because I'm a political junkie and all I do is watch the news. But it is, "Don't confuse activity with progress." Kyle Davis: One of the commentators on TV said, "You know, someone who's drowning [00:09:30] is very active." Jason Barger: Yeah, I like it. Kyle Davis: They're flailing all over the place, but they're not moving anywhere. That's just something to keep in mind. Jason Barger: Well, but we do that every single day in our teams and organizations. This is why with a lot of teams and organizations, that's the way they're connecting with this message, is because it relates to, how do we lead? If I am a leader of a team, how I show up, the people on my team are taking their cues from me. How I lead, [00:10:00] what I show them, I've been saying all along, I do a lot of speaking around leadership and culture and clarity of mission, vision, values. What I've been saying recently is that the term leadership has been hijacked. All those news things you're referencing, we throw around the term leadership so loosely, and yet we don't often take the time to step back and ask the question of, "What does authentic and compelling and effective leadership look like on our team? And can we and everybody around that conference table understand that [00:10:30] these are the attributes, this is what leadership looks like in action for us. And are we committed to then developing those with each other, with ourselves? And then, do we have clarity around the culture that we're trying to create with our team and throughout our entire organization?" Gail Davis: Verses what I do. Gail Davis: You know, I think in building the company, I [00:11:00] became a master of the to do list. Gail Davis: But we kind of lost something in the process. I'm really honed into that. I love that, and I even noticed this morning I came in and I stopped by with one of my colleagues. I could just sense something about her before she said anything. Gail Davis: I said, "How are you today?" And she goes, "I'm so busy." I thought, "Oh, I know where she learned that. She learned that from me." Gail Davis: What have we got [00:11:30] going on? Let's get grounded here. I love that one, it really resonates. Jason Barger: Yeah, and it becomes our default and I say that to groups all the time, that we need to let our being drive our doing. We're rooted in our being, is who is it that we're trying to be in the world? Then what we can do is perpetuate that busy-ness. We just begin. All we're doing, we're just task masters. Jason Barger: Yet, we're more effective at fill in the blank. You're more effective, I know this for myself, I'll just personalize it. I am a more effective husband, [00:12:00] father, friend, and now let me get to all the teams and organizations I serve, I am more effective when I am rooted in my being, and then my doing comes from that. Gail Davis: When this coach started explaining this concept to me, it was so maddening for me because I didn't know how to measure it. Gail Davis: Like a to do list, task. Gail Davis: I can knock out 40 a day. Jason Barger: Right, right, right. Gail Davis: My way of being, how do I measure that? But I'm starting to get it. Gail Davis: You're validating it. I love it. Gail Davis: I was thinking there are so many metaphors in this baggage claim thing. Gail Davis: I was thinking about being unique. I mean, how many more black Tumi's can we have? Gail Davis: I was thinking about insurance. Like, you never think of having insurance on your baggage until you need it. Gail Davis: I don't know, there's just a lot of stuff there. Then just the overriding metaphor of what baggage are you carrying around? Gail Davis: And do you need to have baggage? Jason Barger: No, no, no. All throughout the book are those kind of examples of different stories, or different metaphors within the [00:13:00] airport. You know, the whole ding thing, which I think is fascinating. When the airplane lands, I mean just coming into Dallas. The airplane lands and the ding goes off, and you know the doors don't even open, but instinctively, what do we all do, is jump up and everybody rushes down the aisle. Jason Barger: What we end up doing, is we end up then awkwardly standing with our face next to somebody's shoulder, and crowding each other. We understand the doors don't. Then you know, five minutes later when [00:13:30] we're finally off, you see the same people that were rushing three aisle seats ahead, you know to get ahead in line, you see them waiting in line at Starbucks. Gail Davis: Some of it is a little bit cultural too. Gail Davis: I started my company because of a gentleman named Nando Parrado. Gail Davis: He's from Uruguay. Nando has so many funny observations about American travelers. Jason Barger: Yeah, take my time. Gail Davis: He would you know, just really takes his time with travel. [00:14:00] Anyway, it's kind of humorous. I would love to talk about your new book, because I'm fascinated with the difference between a thermostat and a thermometer and how that impacts culture and the responsibility leaders have with it. Jason Barger: Yeah, no I appreciate it because the way that this has all flowed then from that baggage claim thinking of, how do I individually move, is now into the next question of how am I helping to create a culture with the people around me and who I [00:14:30] work with every single day. 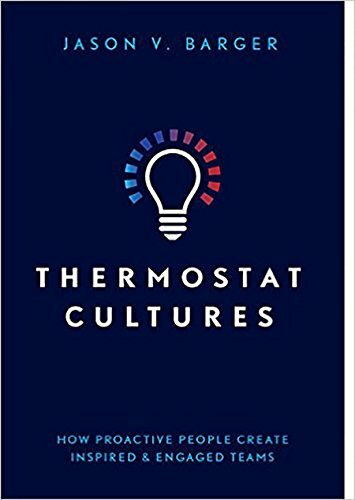 My newest book, "Thermostat Cultures," which just came out in November, is the difference between a thermometer and a thermostat is that one of the central images in the book. If you know a thermometer, all it does is read the temperature, right? If a giant thermometer was on the wall over here in your wonderful HQ here, all it would do is go up and down and read the temperature in the room, right? All [00:15:00] it would do is react to the external conditions in the room. That's all a thermometer does, is it just tells us what the temperature is. There are too many individual leaders, teams, and organizations that entire companies that get stuck in thermometer mode and they get stuck in this just very reactionary thinking. When they don't have clarity around not just what they do, but how they're committed to doing it, or what type of leaders. If they don't understand [00:15:30] their being of what type of leader we're trying to be, or what type of team we're trying to be, then they get stuck in this reactionary thinking. The thermometer just goes up and down, depending on who's in the room or I'm feeling that day. When something doesn't go our way, chances are when we're stuck in thermometer mode, we react. It's usually, you know, who's to blame? Who's fault is it? It's usually knee jerk reactions or short judgements. it's usually short sighted. Yet, when you study the [00:16:00] best teams and organizations and individual leaders in the world, they operate more in thermostat mode. Meaning, unlike the reactionary thermometer, they operate in proactive. They are, a thermostat sets the temperature, or regulates the temperature, controls the temperature. Proactively, the best teams and organizations have a clarity around what is the temperature that we're trying to set together. What is that? When we begin to operate more [00:16:30] proactively and intentionally, thinking about what is the culture that we want to build? Right now, this kind of cultural architecture and design is so important because we throw this term culture around so loosely, and yet we need to know how do we intentionally set the temperature that we want? I talk about the six A' of leading change, but how do we assess, align, aspire, articulate, act and anchor our way into the culture and setting [00:17:00] the temperature that we want? I'm convinced that the best, I mean you watch all of the examples we would come up with, the best teams and organizations on the planet are the ones that have clarity around this is the temperature we're trying to set. Kyle Davis: If we're using the thermostat analogy. You know, you mentioned the six A's and how people are trying to find it, whereas you know, someone has a thermometer, they're [00:17:30] displaying what the temperature is in the room. It could be a cold day, it could be a hot day, and they're just reacting to whatever it may be. But when it comes to, you know, finding and establishing what that temperature is and acting like a thermostat whether it be in culture or leadership or what not, you know the first A that you mention is assess. One of the trends and things that we talked about is that you know, people need to assess kind of what it is that they're doing and everything else. Kyle Davis: I guess my question for you is, is [00:18:00] what what type of introspective work or what's necessary for people to really just you know get past themselves and really know what it is that they're trying to establish and put forth within their culture and probably even beginning with themselves? Jason Barger: Yeah, well we do that from an individual level as we help teams and organizations assess themselves individually as leaders, because I talk about before you start dreaming about what you want your point z to be, you know which is one of the A's is aspiring, where do we want to go? What do we want [00:18:30] to be different? One of the most common mistakes we make, is we aren't honest about where point A is. We have to step back and actually identify, well where are we as an individual leader or where are we as a team? We have assessment tools, but then also exercises to do to help us understand, where am I individually as a leader or where are we as a team? So that then as we begin to assess that, then we can begin to align human beings. We live [00:19:00] in a fascinating world right now. We live in a participatory culture. When we think about aligning people, and I could see the way you were asking that question of, but then how do we start bringing people together? How do we get everybody on the same page as to what that temperature is that we're trying to set? Well I would suggest, and I talk about this in the book, is that we live in a participatory culture now. The old mode of leadership as the CEO or the boss, or the head [00:19:30] honcho, or somebody from above then just grants some memo out there, that, "Hey, this is what the culture's going to be. You know, everybody follow it," is not true anymore. I would argue, it never really has worked. Yet we live in a participatory culture. What I mean by that is, I study trends and things that are popular in the culture that will help reveal to us, what is that mean in terms of our own leadership and culture? Let me give you some examples. Starbucks was one of the first places that [00:20:00] you know taught us this, that we live in a participatory world. In fact, Howard Behar who's their former president who started you know when they were at 15 stores and then he lead them to 15,000 stores around the world, has become a great friend and mentor to me. He would tell me this from the very beginning. It wasn't about the coffee. They got really clear from the very beginning that you don't just walk into Starbucks and think I'm the only one left on the planet that walks in and says, "Hey, just give me a black coffee." Because they look at you and they say, "No, no, no, what do [00:20:30] you want?" Because they want you to participate in the creation of your own cup of coffee. They want you to go down the line and say, "Yeah, I want a double soy with latte or mulch or whatever it is you put in it," right? Jason Barger: Mulch, yeah. Extra mulch. Maybe a little soy sauce. Whatever you put in it, they want you to participate in the creation of your own cup of coffee. Chipotle right now, is the leader by a mile in the fast casual industry. A 21 billion dollar industry right now. [00:21:00] Why is Chipotle being successful? Well one of the reasons is because you don't walk into Chipotle and just say, "Give me a burrito." They'd look at you like, "Well what kind of burrito do you want?" You go down the line and what do you do? You say, "I want some of this, I want some of that." By the end of the line, you don't just have a burrito, you have your burrito. You know, Wayze, the app Wayze that's so popular right now, why is it a different [00:21:30] app or why is it been so popular different than any other GPS tool? It's dependent on all the other people that have the app to participate in telling you, "Hey, there's a cop up here." "Hey, there's a car on the side of the road." "There's a pot hole up here." Then all of the sudden, everybody is participating in the creation of that cup of coffee, or that experience on the road. All of these examples reveal to us that we're living in a participatory culture. What does that mean? That means when we talk [00:22:00] about leading people and building culture, that people want to particpate in the creation of their culture. The places that are doing the best are engaging their own people within, engaging their minds and hearts over what is the temperature that we want to set? What is the culture you want? At Zappos, or AirBnb, or Starbucks or any of these places, it isn't just dictated from above, but it's about, I talk about conversations [00:22:30] that are the currency for change. They are involving their people in conversations that are the currency for change about what is the cup of coffee that we're going to create together? Not just what we do, but how we're committed to doing it every single day. Kyle Davis: And then it's just straight into, "This is what we aspire to be through articulation." Kyle Davis: It's this whole skipping and getting people into alignment, because some people maybe they're just not in alignment with them and that's okay. Let's part our ways. Then some people who you mention what is that may inspire them to do something else, but they're just skipping that whole step and just going into something without getting everybody a chance to even buy in. Jason Barger: Yup. We mess it all up when we do that, right? Kyle Davis: I mention it all the time. I can't think of one office space that I've had that had an office where I couldn't see into it. Everything had glass doors. Kyle Davis: I could see into everywhere. Kyle Davis: There was one time at one place, where they went out of their way to cover everything up so we couldn't see what was happening [00:24:00] inside. Kyle Davis: And what came out, no one liked. Kyle Davis: It was very telling. I'm going to leave the company out, what their name is. But it didn't allow us to have any buy in to it. It was just two weeks of them in a room cornered off. I'm just kind of curious as to you know, is it new companies going this new route getting the alignment and doing the right thing? Or is it just kind of this old business mentality of, "I'm a CEO, I'm your manager. You know, this is the only way of legal dictatorship in America today." Kyle Davis: What [00:24:30] is it? Jason Barger: Well, there's a tension there that you're describing. What often happens because we're living in a world that is so fast, is that our tendency is, and why change initiatives fail, are often times because we get going too quickly, or we start to then think we're in too big a hurry, so we start skipping steps. One of the things that we skip is gaining alignment with our own people around why are we even making decisions that we might be making? Even if it's a great decision for the future of the direction of the company, [00:25:00] if we don't have buy in and haven't created alignment within our people, often times what can happen is then we can ruffle feathers and people can then the culture can be impacted because of it. George Bernard Shaw, I love this quote. He said, "The single biggest problem with communication, is the illusion that it's taken place." Every single day, there might be having that meeting behind closed doors. Behind those closed doors, the communication might have been clear, but if [00:25:30] it isn't then clear to everyone else that wasn't inside those walls, then often times we can walk out of the room thinking that we have communicated, or thinking that, "Hey, we sent that one email. We thought that probably would've done the job." When the single biggest problem with communication, is the illusion that it's taken place. That's why following the steps and gaining alignment is so important. When you talk about generationally speaking, right now also, and I'm guessing that maybe there's part of that in your question too [00:26:00] of just your different generation, and also the startup world and those environments, but people more and more especially generationally speaking, are asking good questions. They want to know not just what we're going to go do, but why are we going to do it? They want to have a job that matters. They want to understand what's my role, and how do I contribute to this thing that we're trying to do that's greater than ourselves? I want to participate in the creation [00:26:30] of it. I may understand that I have a role and there's stuff I don't want to do, but I also want to know that I'm connected and that I want to participate in where we're trying to go together as a company. Kyle Davis: You mentioned the word why, like why are we doing this? Kyle Davis: As like a generational thing, I think. I have a friend of mine who worked for a big consulting firm, and not the awesome one that you're going to speak to later today. But you know, he asked his supervisor, superior or whatever [00:27:00] after receiving some information he goes, "Okay, well why?" Kyle Davis: And the bounce back, like was back and forth little kind of retorts back and forth. Then eventually, his supervisor said, "You know what? I just don't know why." Jason Barger: Yeah. Kyle Davis: It's hard to convey or to convince if you don't even know the why. Then if you're just pushing it down, you know what I mean? Kyle Davis: It's hard to get that buy in. Jason Barger: Yeah, absolutely. The very best places are the ones that are able to articulate. Again, the single biggest problem with communication [00:27:30] is the illusion that it's taken place. If we haven't communicated it within our teams and with our people, not only this is what's going to happen, but this is why we've made the decision. This is why we're going the direction that we have. Often times, it takes more time to do that, which is why it gets left off. But when we do that, people feel more valued, they feel more appreciated, they feel there's greater buy in because they feel like they were included. They cognitively can understand, "Oh, there's a strategy [00:28:00] behind why we made this decision, and now I'm bought in and I understand how my contribution helps us get in that direction." Kyle Davis: It seems like when you read over the six A's that you have here, it seems like a lot of the heavy lifting happens in the first five, and then with six it's the anchor. But that's the thing that kind of holds everything into place. Jason Barger: That may be the most important one of all of them. Yeah. Kyle Davis: Right, so I'm wondering if you could talk about that for just a moment. Jason Barger: Yeah, absolutely. I [00:28:30] got a little bit of a problem with the term change management, you know? Everybody throws that around and I love the principles of it and all that, but the term change management, I've never really liked because I don't think we're trying to manage change. I talk about the six A's of leading change, because I think we are again, if we're in a proactive mindset, then it really ought to be centered around looking out not the rear view mirror in our car, but looking out the windshield of saying, [00:29:00] "How are we all going to play a role proactively and intentionally in leading change?" When we follow those steps, one of the most common missteps as you alluded to, we may go through the first one, two, three, maybe even get to five, where now we actually start putting things into action and we start doing things. But then a common misstep is we feel like we've done it. We feel like we've rolled out a new initiative, we make a giant thing about it at the annual meeting, [00:29:30] we celebrate, we've got this new initiative underway. A honeymoon period begins and then often times we're onto the next shiny object. The anchor, which is the last one of those six A's. Actually, if you see in any of my speeches or in the book, I talk about the fact that those A's that there are arrows going in both directions. That those A's actually never stop. But the anchoring is, we have to not just do something once, we have to anchor it within our teams and our culture and [00:30:00] our habits, so that the change we want to see, the actions become habitual. It becomes a part of just the way that we move throughout the world. If you know anything about the world of marketing and you've heard the phrase that marketers throw around about the rule of seven. They talk about you got to mention something seven times before somebody, and when you're selling a product, you'd have to say if I'm selling this Fiji water, little plug for Fiji there. If I'm selling this, I'd have to say, "Hey, [00:30:30] have you heard of this? It's great water, right?" And I tell you about it once. And then I'm going to have to circle back with you and say, "Hey, remember the Fiji water? So refreshing, you know?" Then a third time, fourth. By the time you get to the seven, the marketers would say, that's when you finally say, "You know what? I could really go for a Fiji water." And then you buy it, right? Jason Barger: They talk about it in terms of the rule of seven. You have to do that. When I think of the distracted world we're in right now, it's more than seven. But from a development [00:31:00] perspective, I believe in developing people and culture in our organizations. We have to remember the rule of seven and even beyond that when there are messages, stories and things that values that are important to our culture, we need to continually anchor them over time the rinse and repeat of why those are important so that it just becomes the way we do it. Kyle Davis: I like the rinse and repeat of stories. This is something that's happened a lot in a lot of the successful [00:31:30] companies that I've been in, is that they rinse and repeat. They tell the same story over and over again. Maybe with a little bit of a different twist, a little bit more elaboration, but the fundamental it's the same story. I'm just kind of curious if there was some truth to that or you have some insight on that. Jason Barger: Absolutely. No, I think the best places are the ones that are realizing they can't run from their foundational stories. We can't run from what are our values. As the best teams and organizations have clarity around, these [00:32:00] are the values that are going to help drive not just what we do, but how we do it. They can't run from those values. They have to continue to return to those stories, but they also have to get good about we live in a story telling world right now as well. We have to be experts and adapters and creators to find new ways to tell the same story. If one of our values or your values as a company is to be innovative, [00:32:30] then we need to find new ways, refreshing ways, all the time to be sharing stories with our people about what it looks like in action and behavior to be innovative. Gail Davis: But I'd like to know how your history in the non-profit world has added value to you being out there as both a consultant and a speaker. Jason Barger: Yeah, absolutely. Well yeah, that's a great question. The first thing that I would say is that my experience leading all of these people. I was lucky to be in a role for you know, ten years where I was mobilizing and leading all these projects and programs [00:33:30] for literally thousands of people. I was lucky to be in a leadership role where I was not only the visionary and the program designer and the budget person and the sales person. But then to go actually lead the stuff. I was so fortunate to be in a role that allowed me to be able to wear all those hats and then have to be truly mobilizing people to do this work. Then you know what I say [00:34:00] to people all the time is that what is an organization? It's just a collection of humans. Literally, whether it's you know, the fortune 500 company down the street or a school or university, or a non profit, or whatever it is, all it is is a collection of human beings. When people ask me, "What is it the work that you're really doing?" I say, "If you want to boil it down most simply, I'm [00:34:30] in the business of engaging peoples', human beings' minds and hearts to think about how they lead in the world and then how they contribute to building cultures to do whatever it is they do more effectively." Gail Davis: That's a perfect segway to my back end question, because my favorite speaker is someone when I walk out of the room I'm like, "Man, I'm going to apply that in my business, and I'm going to apply that personally." Gail Davis: I know you're a father, and I know you're a husband. I'm just curious how this work that you've done has impacted the way you father, and [00:35:00] the way you know you are as a husband. How do you carry these principles into that? Jason Barger: And [00:35:30] sons, all of that throughout the whole human family is represented in whatever your company is. I understand the best speaker, I believe, is going to be again, when I talk about connecting engaging someone's mind and heart about who they are as a human being, and how that then connects to whatever it is we do. You know, it was Eugene Peterson I think it was. No, Eugene Ware I think was the one that said it. Is that one person [00:36:00] with passion is better than 40 people merely interested. One person with passion is better than 40 people merely interested. Ian Forester, that's who said it. English novelist. What I think about that every single day, is what is it mean to be a person of passion as a husband? What does it mean to be passionate rather than merely interested? What does it mean to be passionate as a father, rather than merely interested? With the teams and organizations [00:36:30] I'm lucky to serve, what does it look like for me to be passionate rather than just merely interested? In the teams and organizations across this planet, there are people, human beings, that are dying to be engaged in their minds in their hearts right now about what does it look like to be a person of passion rather than just merely interested. Kyle Davis: With that being said, and you know, how my mom Gail mentioned that there's [00:37:00] personal then there's also the professional, one of the things we are heading towards wrapping up though. One of the things that I've noticed and we've discussed, is that your book, "Step Back from the Baggage Claim," has multiple different editions. Kyle Davis: Because there's different ways to apply that. I was just curious, I mean, I don't have them all in front of me. Kyle Davis: Can you list some of the editions off, if not all of them? Jason Barger: Yeah, yeah, yeah. 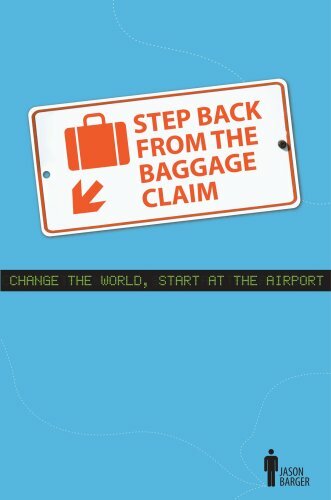 The first book, "Step Back from the Baggage Claim," there was the original edition. Then from that became the business leader edition, which partnered [00:37:30] and collaborated with Howard Behar, the former president of Starbucks on what does that metaphor mean for teams and organizations. Then there was a healthcare edition, with Chip Souba, the dean of the Dartmouth medical school, talking about what does this mean for healthcare and the state of healthcare right now. Then Christian Long, an education consultant, of talking about what does this mean for schools and educators all around the world. 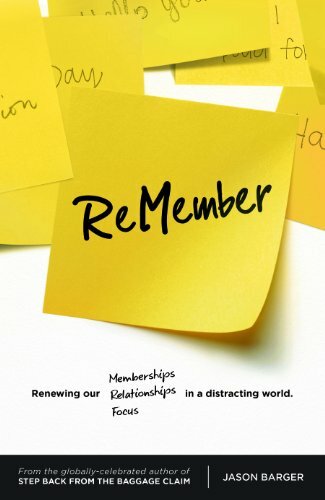 Then from there was my book, "Remember," which was talking about what are the things we need to remember [00:38:00] on an average day, and what is it then to remember, meaning renew our memberships, our relationships, and our focus to the things that are most important to us. Now thermostat cultures is taking that to say, now how to we begin to build the culture with the people, and the teams, and the organizations we serve. Kyle Davis: Very cool. Well hey, look, if y'all want to get Jason Barger to come and speak for your event, association, company or well you just want to have Jason in your life, you can do so [00:38:30] by contacting GDA Speakers at 214-420-1999 or by visiting GDAspeakers.com. If you go to GDApodcast.com, you'll be able to see all of the books that he just mentioned as well as his new book, "Thermostat Cultures," and today's transcript and everything else. Finally, please subscribe on iTunes, rate and comment. It helps us out. Thank you. Gail Davis: It was great having you here, Jason. Thank you. Jason Barger: Glad to be here, thank you.